Appearing in the 1967-8 catalogue but it always seems a much later car to me. There had been the lovely Sting Ray with its fold-away twin jewelled headlights. They didn’t always swivel perfectly but it was a lovely model and very desirable now in all three colours. This is a much cheaper production. No swivelling lights and strange chrome protuberances everywhere in what they call a ‘customised’ version. 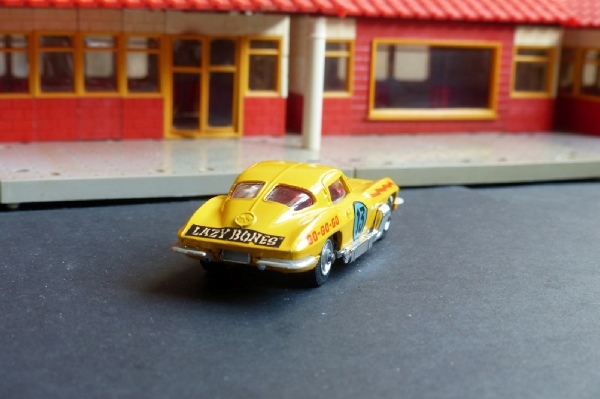 Bright yellow paint and crazy decals may have had some appeal but generally it was seen as the first sign of decline at the time. It has the same wheels as had appeared on the Monkeemobile and possibly one or two others. This has a tiny mark on the roof and the chrome has come off the front bumper. The paintwork and other chrome, though, are good with excellent wheels. The windows are clear and the decals are all present and intact. It has a nice box which is nice and clean and bright but it has an end flap missing.